Alonzo Mayo makes a tackle. The defensive back was one of a number of Northwestern players who stepped up with numerous injuries on the defensive side of the ball. MINNEAPOLIS — The football ricocheted off Northwestern cornerback Cam Ruiz, glanced Minnesota receiver Rashod Bateman and then briefly hovered near Ruiz’s helmet before being batted towards the sky by linebacker Paddy Fisher. Just before it hit the ground, rendering all of the madness pointless, senior linebacker Nate Hall dove beneath it for his first interception since the season’s opening night. Team efforts like that continued throughout the afternoon and helped the No. 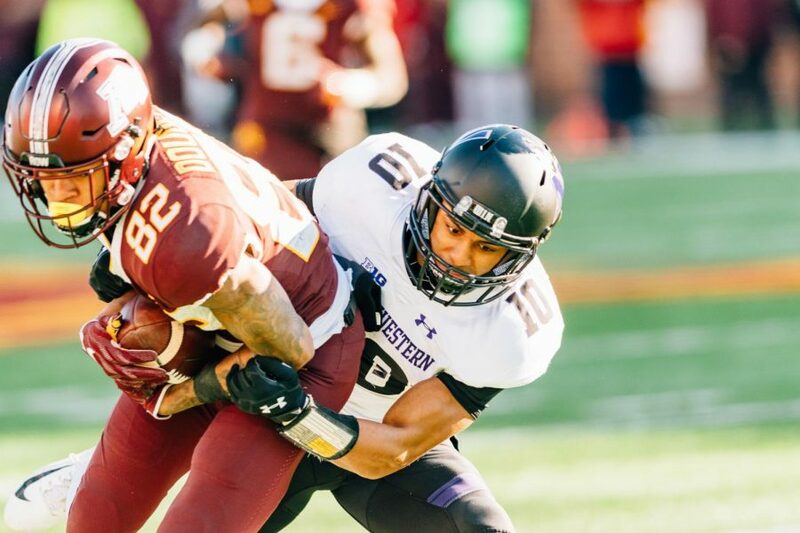 22 Wildcats’ (7-4, 7-1 Big Ten) undermanned defense, missing three usual starters in the secondary, lock down the Golden Gophers (5-6, 2-6) en route to a 24-14 victory on Saturday. One week after rolling for 415 yards and 41 points in a beatdown of Purdue, Minnesota’s offense managed only 306 yards and 14 points on Saturday, a significant chunk of which came in garbage time with the game’s result already determined. Even more importantly, the Cats forced three turnovers: two Hall interceptions in the first quarter and a smooth strip-and-scoop by defensive end Joe Gaziano to essentially seal the game in the fourth. In the last four meetings between the two schools, the Gophers have averaged only 10.8 points and 247 yards per game against NU. After Saturday’s game, coach Pat Fitzgerald offered a detailed analysis of how his team has consistently stopped Minnesota’s system. Safety Jared McGee and cornerbacks Montre Hartage and Trae Williams all missed the contest, leaving substantial holes in the secondary that lined up to face young Gophers quarterback Tanner Morgan. Yet those holes didn’t last long. Ruiz, a redshirt freshman, and veteran Alonzo Mayo filled in admirably on the edges, and sophomore Travis Whillock — a former high school teammate of Fisher in Katy, Texas — produced a memorable performance in the defensive backfield. He finished with 15 tackles, a team- and career-high, and upped his total to 34 over just the past three weeks. Fitzgerald said his annual preseason message to players who don’t crack the first week opening lineup to prepare as if they’ll be called upon in October or November has paid off particularly well this season, as the team has now won six of its past seven games despite widespread injury concerns in all phases. This weekend, it was Fitzgerald’s defense that powered the team to their latest of those wins. “For our defense to do what they did today I think was a pretty strong statement,” the coach said.